This trip report is, in many ways, superfluous. After all, I visited Funderland Dublin at the end of last year and chronicled my thoughts there. Visiting the same showing of a fair on more than one occasion leaves one with precious little new to say. 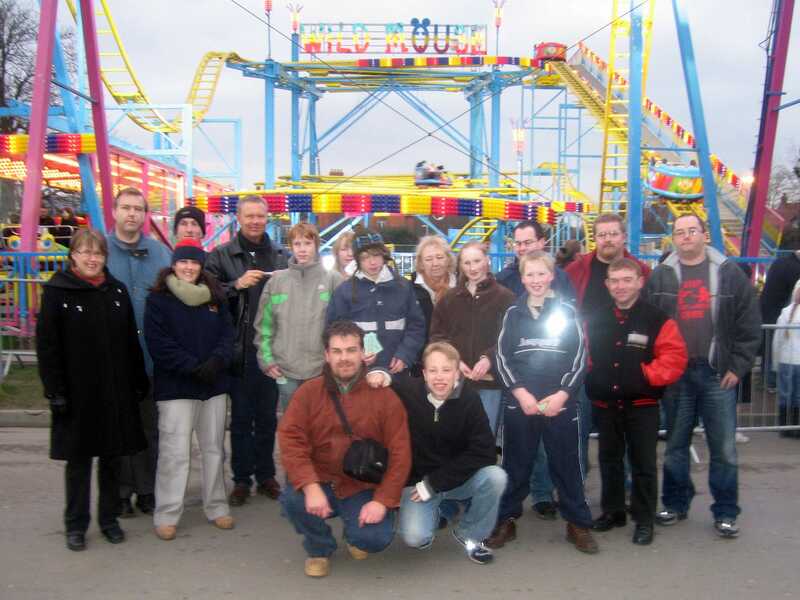 To that end, I intend to pass only brief comment on the fair, and instead dwell in more detail on organising a fun day out for the seventeen coaster enthusiasts, largely members of the European Coaster Club. These people flew to Dublin for the weekend from lots of different places: Blackpool, Birmingham, Bristol, Liverpool, London, and Trondheim, all for what I hope will become an annual social event. Making everything run smoothly proved to be more challenging than I had anticipated, but the end result was well worth it. It would be remiss of me not to comment, at least in passing, on my own state over the course of this weekend. On Friday afternoon, just as the first club members were landing in Dublin, I began to feel unwell. By that evening, when the group went out to dinner, I was in an awful state. Every few minutes necessitated a rapid and impromptu visit to the bathroom, where my stomach rudely ejected what little amounts of my dinner I had managed to choke down. Saturday marked somewhat of an improvement, but I was still seriously under the weather. However, I adopted a philosophical outlook on the whole thing; this event had involved a lot of planning, so I was going to enjoy myself - whether I liked it or not! What does a tourist do on a visit to Dublin? One could go visit the Guinness Brewery. One might want to explore the National Museum, Dublinia, or one of the Cathedrals. A group of coaster enthusiasts, however, can be accommodated far better with low brow entertainment, and my choice for the morning was a visit to Kylemore Karting, Ireland's largest indoor karting arena. A full grand prix seemed like the most sensible option, and I duly arranged a bus to bring us all out to the circuit. Everyone competed in several short heats, followed by quarter finals, semi finals, and a fifteen lap grand final. The competition was fierce; I had qualified on pole position, but on lap three a badly judged corner allowed John out into first place. He would have won the final without question had it not been for traffic on the course, when we all attempted to overtake a driver who was a lap down. He got in the way; John crashed into him, I crashed into John, and Malcolm overtook us both. I managed to reclaim second place in the closing stages, but Malcolm got the trophy. He has vowed to return next year to defend it, when his luck may well swing another way! After returning from Kylemore Karting we headed as a group to Funderland Dublin. The marketing people had given me a supply of free ride tickets, which I distributed among the group. This went down extremely well, and was only topped when I was informed that we'd be getting more. In the end, there were more tickets than the group could use, allowing everyone to ride to their hearts content. This was completely unexpected, and extremely generous on the part of the promoters. I would like to publicly acknowledge all those in William Bird Sales Ltd who made this possible. Before entering the main building, I took the obligatory group photo, and a friendly passer by took a shot for us too. I wrote a commentary on the interesting rides at Funderland in my final report last year and don't propose to repeat myself here. However, the signature attraction for the year, Starflyer, was now up and running. The park model was, after all, my favourite attraction in Wiener Prater, so I had high hopes for the portable version. Unfortunately, it wasn't to be, for one main reason: the ride cycle was simply too short. I know this has been said all over the place, but it bears repeating. Perhaps at the Oktoberfest, when there are huge queues, a short cycle is a necessity, but when only half the seats are in use due to small crowds surely a longer cycle time would have been in order? I'd guess that we were at full height for at most 45 seconds, which for a ride like that is nothing. This is an absolutely trivial thing to fix for future shows, and with that solved I imagine people will be much more positive about it. Booking the entire seating capacity of a restaurant is great fun. It is amusing to receive a phone call the day before making sure you are still coming (we were), and even more amusing to receive a nervous sounding phone call five minutes after your booking asking where we were. (As it happened, we were about thirty seconds away on foot when that happened!). I'm not going to talk about the restaurant we went to just in case any future visitors learn the secret. Suffice it to say, however, that the food was superb.